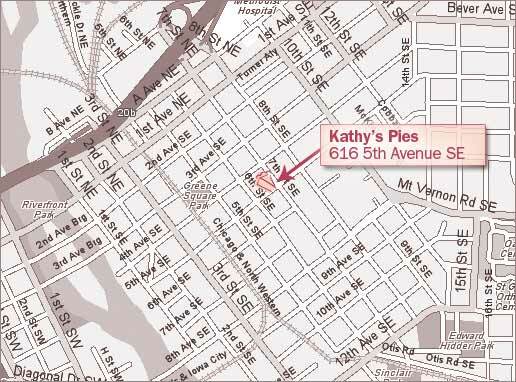 Kathy’s Pies is located at 616 5th Ave SE in Cedar Rapids, Iowa. Turn Left on to 6th Street S.E. Follow this down to intersection with 5th Avenue S.E. Turn to your Left, (one way street) and we are in the middle of the block, on your Left. Turn Right on to 6th Street S.E. Take 8th Avenue S.E. to intersection with 6th Street S.E. Turn Right on to 6th Street S.E – follow to intersection with 5th Avenue S.E. middle of the block on your left. Take a right at intersection of 7th Street N.E. and 1st Avenue N.E., go one block. and follow this down to intersection with 5th Avenue S.E. Turn Right on to 7th Street N.E.